SMTP (Simple Mail Transfer Protocol) is the Internet standard protocol for sending and receiving messages between mail servers. These servers use internally assigned ports to facilitate various communications and provide other services. Standard (aka "well-known") ports for Internet services developed over time. The standard port that your ISP's own mail servers use for communication with other mail servers is port 25 (just like port 80 is used for http: web browsing, ports 20 and 21 are used for file transfer protocol (FTP), port 23 is used for telnet and so forth). For end users wanting to send and receive e-mail using a mail client of some kind, e-mails are relayed to an actual mail server using SMTP protocol. But e-mails are instead received/delivered to mail clients using a different protocol (typically POP3 or IMAP). In an application like Advanced Accounting, the most typical need is the ability to send e-mail out of the software most often with an attachment (sales order, sales invoice, quote, purchase order, statement and so forth). Therefore, in setting up a user's e-mail settings to accomplish the relay of the outbound e-mail, SMTP settings must be established including the name of the SMTP server. Port 25 remained the common port for use with mail clients for much of the first 25 years since the development of Internet networking standards. Some mail server providers still provide that capability. Increasingly however over the past decade in an attempt to control spam, port 25 started to be blocked for use by mail clients and is now typically blocked by most providers. At first the approach was to simply use other ports such as 2525. Authentication started to also become routine often with the alternative port approach (or with the standard port) which basically requires that a user log-in (typically an e-mail address) with a password in order to successfully send an e-mail. Authenticated e-mails however were still commonly being sent as plain text until so-called secure or encrypted methods were developed and started to become common practice (particularly as a result of leaked, illegal NSA surveillance techniques). These methods, most commonly SSL/TLS (collectively "secure socket layers"), use authentication combined with more private means of communication and are most often also used in connection with ports 465 and 587. Web-based mail clients (aka "webmail") running on web servers typically require SSL/TLS support. With two factor authentication now becoming more common, the complexity of successfully communicating with mail servers is becoming even more complex. Advanced Accounting's support for e-mail: The Advanced Accounting 6.x series was the first version to support outbound e-mail and provide therefore SMTP communication capabilities. Version 6, while also providing the ability to authenticate, only supported standard port 25. Starting with a release of the Advanced Accounting 7 series in 2009, a user could specify any SMTP port. Towards the end of 2013, SSL/TLS support was available in version 7. Note: in Advanced Accounting, we are only primarily concerned with sending, not receiving, e-mails. POP3 support is however available if needed in custom program situations, and has been since version 6. Many options exist in terms of selecting an SMTP mail services provider typically at either no or low cost. Normally your Internet Service Provider (ISP) or other third party provider that already provides your SMTP mail services is your first contact of choice and should be able to provide SMTP services to you without charge. If your ISP is either not also hosting your web site or providing mail services, they should still be a strong option to first consider. They will have SMTP mail servers. Another option might be your web site's hosting provider or some third party provider including providers of webmail. It is important to note that your domain based return e-mail address does not have to correspond to a mail server that belongs to your hosting provider in most, but not all, cases. So while normally your SMTP server might most often also be the server through which you also receive incoming mail, it does not have to be. Your mail server provider will have other required settings and port usage and authentication requirements that must be established in order to send outbound e-mails. You will need to determine what those are before being able to establish appropriate e-mail settings for you and/or your other users of Advanced Accounting. We do highly recommend the use of separate Advanced Accounting logons so that you can create separate e-mail profiles for each user, and so that each user can use their own reply/sender e-mail address. In your Advanced Accounting settings, we highly recommend using the BCC: default and therein specifying your own e-mail address so that you will automatically receive a copy of every e-mail that is sent, and which can be archived for follow-up or future reference as desired. Even though your incoming mail may be routed to you some other way, if you have a Gmail account, then you can use a Google SMTP server for your outbound e-mail. (1) You will need the last Adv 7i rel. 7f updates some of which occurred in Feb. 2014 when we changed how we launch the SSL/TLS capable extension. If you are on that release but don't have those updates, we will provide and install them at no charge. These updates will be needed for any provider that requires SSL/TLS. Sign in with you usual credentials if required. In the first drop down box ("Select app") choose "Mail" and in the second ("Select device") choose "Windows computer." Finally, click on the Generate button (will become visible after choosing "Windows Computer"). Copy/paste this password into the password below. (3) Establish or complete your Advanced Accounting e-mail setting under SY-C-A (System Maintenance, Enter/Chg User Security, Maintain Logon Codes) by highlight the logon code, click on Edit, and click on the E-mail settings button. Sender E-mail address: The address you wish to use for the sender/reply e-mail address. 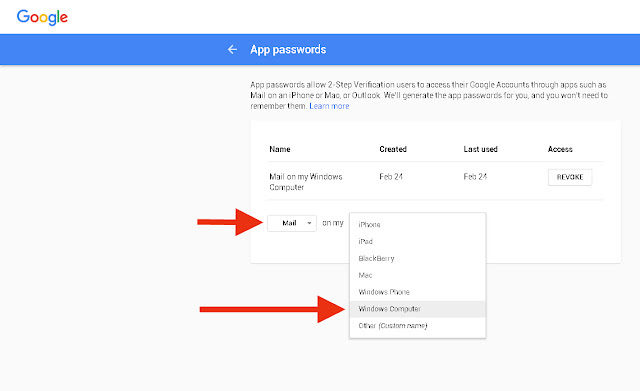 It does NOT need to be the same as your gmail address. You will only be relaying outbound e-mail via a Gmail SMTP server, nothing more. Keep in mind that security measures are constantly changing and the steps that need to be taken in the future may differ from those outlined above.